Rawhide chews and treats have filled pet store aisles for decades, but they’ve become less popular over the last several years as owners have become aware of the dangers that they present. But chews and treats are still important for your dog’s well-being, so you’ll need to find a rawhide alternative to satisfy your dog’s biological need to chew. We’ll try to help below, as we explain the dangers rawhides represent and provide recommendations for five of the best rawhide alternatives around. Rawhides may not be very safe for your dog, but you’ll need to provide him with an acceptable alternative, so he can exercise his chewing instincts. Fortunately, there are plenty of great no hide chews that are usually safe for dogs, including the five detailed below. Be sure to compare all five of the non-rawhide dog chews discussed below, so you can pick the best one for your pet. Nature Gnaws Large Bully Sticks are high-quality dog chews that make an excellent alternative to traditional rawhide chews. Unlike some other bully sticks, which are treated with fragrances and other chemicals to reduce the natural odor of the sticks (an odor, it should be noted, which dogs love), Nature Gnaws Bully Sticks are untreated and all-natural. Owner Reviews: Most owners were very happy with Nature Gnaws Large Bully Sticks. Most dogs absolutely love chewing on these treats, and owners love knowing that their dog has a safe and enjoyable chew treat. 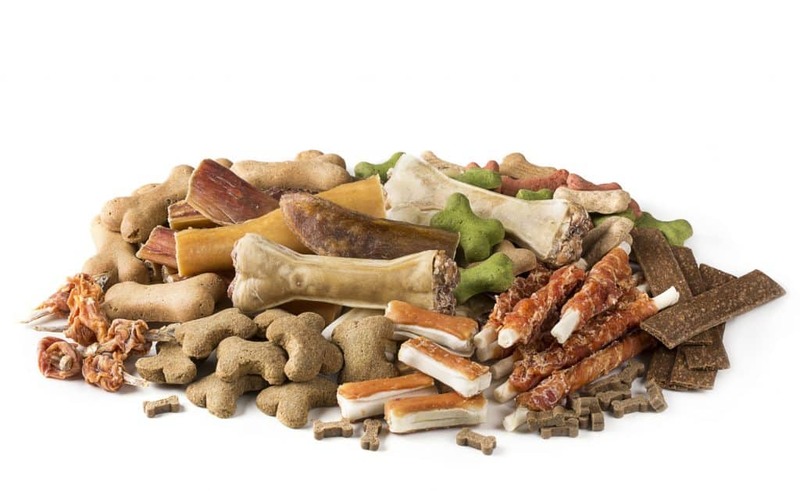 A few owners did complain about the odor of these treats, and several were put off by their relatively high price, but high-quality rawhide alternatives are rarely cheap. 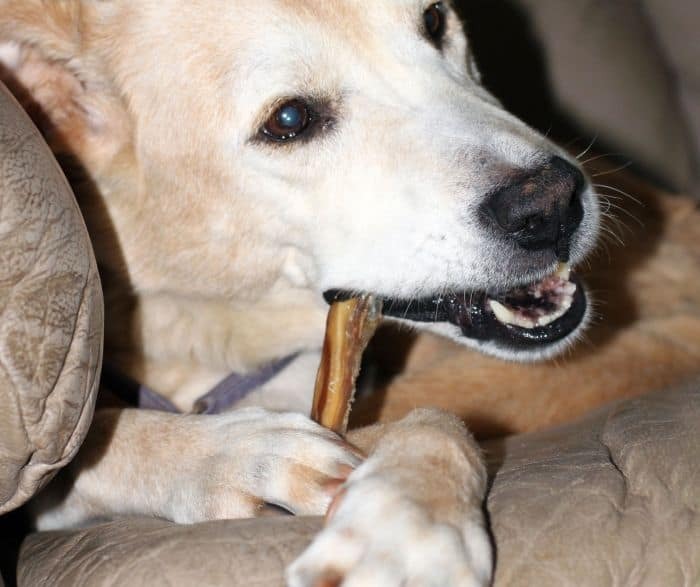 Bottom Line: Bully sticks are a great option for most owners seeking an alternative to rawhides, but not all bully sticks are created equally. Some are manufactured in countries with poor safety standards and others are coated in chemicals to cover up their natural odor. However, Nature Gnaws Bully Sticks sidestep these issues and give you the chance to provide your pet with an all-natural, safe and nutritious treat. Note that the bully sticks listed here are considered “large” by the manufacturer. In our estimation, they’re probably appropriate for dogs in the 50- to 60-pound range. Really big dogs should probably opt for their “extra-large” bully sticks, which are quite a bit thicker. Himalayan dog chews are based on an ancient recipe originally devised by people living in the rural Himalayan Mountains. In fact, they were originally intended for human consumption! Made from four simple ingredients (yak milk, cow milk, salt and lime), these super-durable chews are safe, all-natural and long-lasting. Owner Reviews: Most owners were very happy with Himalayan Pet Supply Dog Chews. Dogs seem to love the taste of the chews and find the texture very intriguing. 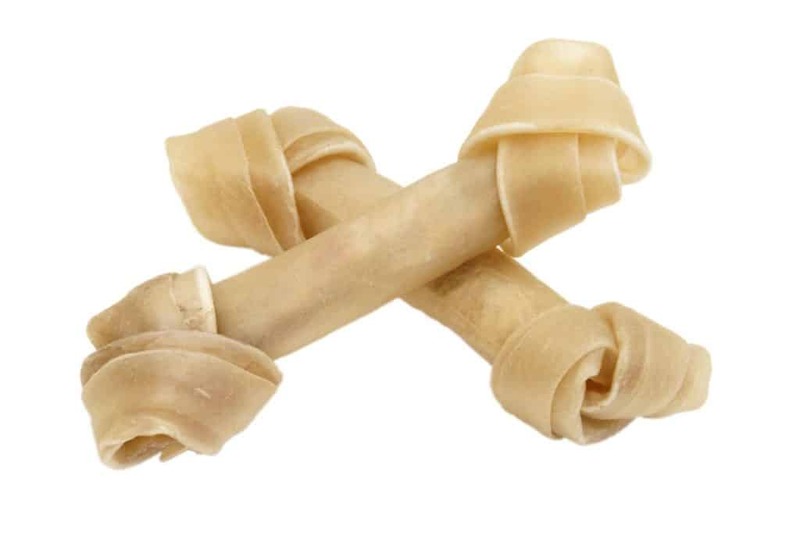 Most owners reported that these chews produced no offensive odor the way some other rawhide alternatives do and that they lasted for a very long time. Bottom Line: Himalayan Dog Chews are typically very popular with dogs, and most owners love knowing that they are providing their dog with an all-natural alternative to potentially dangerous rawhides. They are a bit pricey, but given how long they often last, they still represent great value. Note that Himalayan Dog Chews are best for light- to moderate-chewers, who will simply scrape off very small pieces of the chew at a time. Very aggressive chewers may be able to break off pieces large enough to cause intestinal obstructions. So, as with every other dog chew or rawhide alternative, you must supervise your dog when enjoying these treats – particularly at the outset. Earth Animal No-Hide Beef Stix provide all of the mouth-challenging fun that many other chews and rawhide alternatives do, but they are much more digestible than these competing products. Made from a combination of all-natural ingredients, these chews are digestible, safe and delicious. Owner Reviews: Owner reviews for Earth Animal No-Hide Beef Stix were overwhelmingly positive. Most dogs seem to find these treats delicious and fun to chew, and owners liked having the opportunity to provide their dog with a digestible, all-natural, US-made alternative to rawhides. Additionally, these treats don’t seem to smell bad like a lot of other dog chews made from natural beef products do. Bottom Line: Earth Animal No-Hide Beef Stix are some of the most attractive rawhide alternatives available to dog owners. They’re not only safer than many other dog chews, but they’re also largely digestible, which means they’re one of the safer options on the market. Additionally, they’re priced very reasonably, making them a viable option over the long term. The only potential downside to these rawhide alternatives is that they aren’t especially large. They’re probably more appropriate for dogs in the 50- to 60-pound range, rather than gigantic canines weighing more than 100 pounds. They’re likely safe for larger dogs, but they just won’t last very long. Smartbones Peanut Butter Chews are a healthy and delicious alternative to rawhide that most dogs love. Made with chicken, corn, peanut butter and a number of other ingredients commonly used in dog foods, these chews will give your dog a chance to exercise his chewing instincts and please his palate at the same time. Owner Reviews: Smartbones Peanut Butter Chews received some of the best reviews of any rawhide alternative we reviewed. 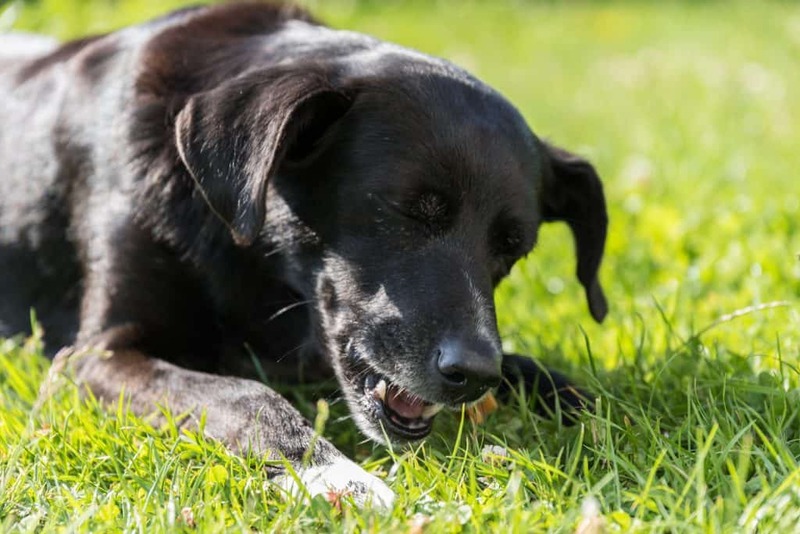 Most dogs appear to love the taste, and owners love knowing that they’re giving their dog chews that are almost completely digestible, which drastically reduces the chances of them causing health problems. A few owners were disappointed to discover that these treats are made in Vietnam. And while this is not ideal (we always recommend treats made in the USA), Vietnam-based facilities typically employ better safety and quality controls than Chinese-based dog treat manufactures do. Bottom Line: Smartbones Peanut Butter Chews are a great option for most dogs for one simple reason: They are 99% digestible. This means they’re unlikely to lead to intestinal obstructions (you should still supervise your dog while enjoying these chews) and are therefore safer than rawhide-based chews. Smartbones are a bit pricey, but they aren’t prohibitively expensive, and it is difficult to put a price tag on your pet’s health, safety and well-being. DreamBone Vegetable & Chicken Dog Chews are rawhide-free dog treats made with real chicken. This means that your dog will not only find them delicious, but you can relax knowing that your dog is unlikely to suffer from the intestinal obstructions and other health problems that rawhide-based treats often cause. Owner Reviews: Most owners were very happy with DreamBone Vegetable & Chicken Dog Chews, and most dogs seem to find them very palatable. Because they are rawhide-free and made from 99% digestible ingredients, most owners feel safe giving these chews to their pet, and the added vitamins and minerals help make these chews even more attractive. These chews are made in Vietnam, which gave some owners pause. However, while US-made products are always preferred, Vietnam does implement stricter safety and quality-control regulations than China does, which may help some owners feel better about these chews. Bottom Line: DreamBone Vegetable & Chicken Dog Chews are some of the best rawhide alternatives available on the market. They have most of the characteristics dog owners would want when picking dog chews, including a largely digestible slate of ingredients, a taste dogs love and a price tag that won’t break the bank. What Is Rawhide and How Is It Made? Rawhide is made from the hides of cattle, sheep and other hooved animals. The top layers of the hide are used to make typical leather goods, such as upholsteries and clothing, while the inner layers are used to make drum skins, whips and the dog chews we’re discussing here. After being separated from the outer hide, the inner hide is subjected to a number of processing steps, which are designed to separate the hide from the fat and connective tissue. Some factories do so by treating the hides with lime, while others do so by washing the hides in a hydrogen peroxide bath. From there, the hides are then dried, stretched and folded into the desired shape (typically a basic “dog bone” shape). They’re then shipped out to retailers, where they’re typically stored in bulk bins. This is important to note, as it provides a route through which even clean rawhides can become contaminated with bacteria found on improperly treated rawhides. The Danger of Rawhides: Why Aren’t Rawhide Chews Safe for Dogs? Rawhides represent a number of potential dangers to pets. That doesn’t mean something bad will happen anytime that your dog eats a rawhide – plenty of dogs have safely enjoyed them over the years. But the risks involved with the treats are simply too high for most pet owners to accept, once they understand the potential for serious illness or injury. If your dog bites off a large piece of a rawhide and tries to swallow it, he could end up choking. And while you may be able to fish the lodged piece out of his throat or perform the canine Heimlich maneuver if you notice your dog choking, you won’t be able to help him at all if he does so while you aren’t home or watching him closely. Rawhide can very easily become contaminated with a variety of harmful bacteria, including pathogenic Salmonella and Escherichia coli strains. Dogs who eat these contaminated rawhides may become sick. In a best-case scenario, your dog may only suffer from some mild vomiting and diarrhea; in a worst-case scenario, he may become seriously ill and wind up spending several days in a veterinary hospital. Bacteria aren’t the only things that may contaminate your dog’s rawhide chews – the chemicals used in the manufacturing process may also linger on the processed product. In theory, the chemicals used in the processing of rawhide chews shouldn’t represent a danger if proper safety protocols are implemented, but most rawhide chews are made in countries with infamously lax product safety standards. Even if your dog manages to swallow a large piece of a rawhide without choking doesn’t mean he’s home free. After all, the rawhide must come out the other end, and rawhide won’t break down very much in his digestive tract. This can lead to intestinal obstructions, which may need to be surgically removed by your vet. Rawhide needn’t be contaminated with dangerous bacteria in order to upset your dog’s stomach. Rawhide seems to simply disagree with the digestive systems of some dogs, and frequently lead to constipation, diarrhea and vomiting. All five of the rawhide alternatives discussed above should be safe for your dogs (although you must still observe your dog carefully – especially the first time you give him one of these chews). However, you’ll always want to consider the following issues when choosing a safe alternative to rawhide. Rawhide chews are made from animal hides, but most alternatives are made from other ingredients. Just be sure that you scrutinize the ingredient list before selecting any rawhide alternative, to ensure that it is made of safe and completely digestible ingredients. It is also wise to avoid rawhides that have been treated with artificial colors, flavors (natural flavors are fine) or preservatives. It is important to select safe dog chews of the proper size for your dog. Doing so will help to reduce the chances that your pet will try to swallow the entire item, which can lead to choking. 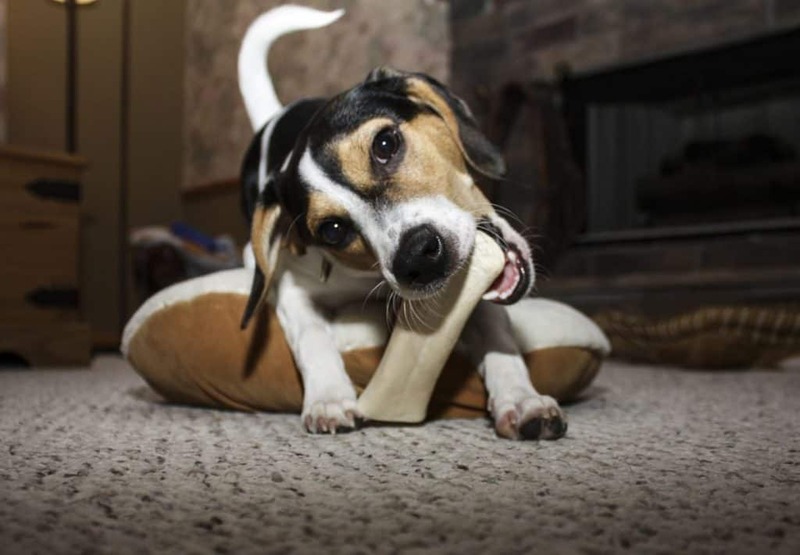 Generally speaking, you’ll want to select the largest rawhide alternative your dog can handle. But picking the largest alternative to rawhide available doesn’t completely eliminate choking hazards, so be sure that you observe your dog carefully while enjoying his chew. If he begins breaking off large pieces and trying to swallow them, you may want to intervene. Always try to select a rawhide alternative that is manufactured in countries with high safety- and quality-control standards. Doing so won’t completely eliminate the possibility of winding up with a contaminated or otherwise unsafe product, but it will greatly reduce your odds of doing so. Essentially, this means avoiding rawhide bone alternatives that are made in China and looking for products made in the USA, Australia, New Zealand, Canada or Western Europe instead. Assuming that the manufacturer uses safe, natural flavoring agents, the flavor of your dog’s rawhide alternative is not a safety issue. However, it is still worth thinking about, as you’ll obviously want your dog to enjoy his chew as much as is possible. Many alternatives to rawhide are flavored with things like beef, chicken, liver or peanut butter. Just try to pick one that your dog appears to enjoy. Chewing is an important part of canine behavior, and it is always important to provide your dog with something safe to chew. There are a number of different chews on the market that are safe for dogs, but start your search with the five above.